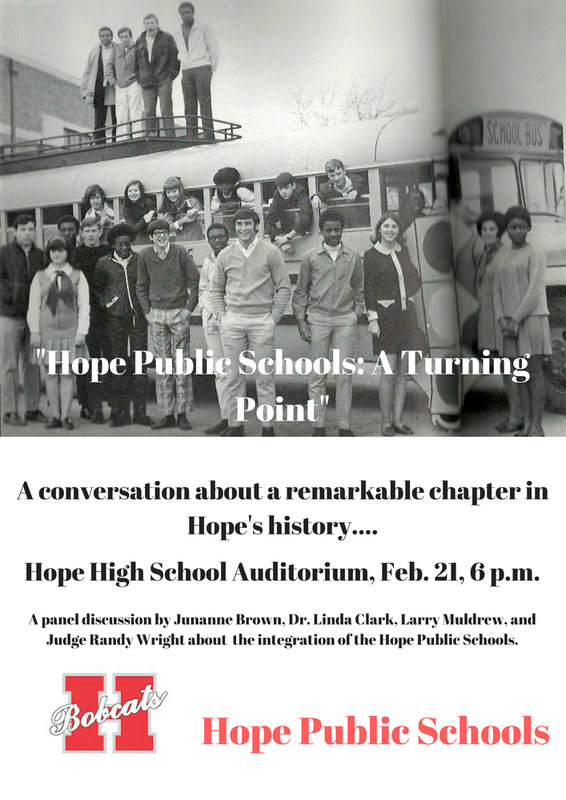 Hope Public Schools: A Turning Point” will be the theme for the evening Thursday for a roundtable discussion of the critical years of integration in the Hope school system. The program is open to the public and begins at 6 p.m. in the Hope High School Auditorium. A panel of former Hope school students will discuss their experiences and answer questions compiled from current social studies classes about that period. HopePrescott News Co-Publisher Mark Keith will moderate the discussion. Hope Superintendent Dr. Bobby Hart said the panelists for the evening will include Eighth Judicial District North Circuit Judge Randy Wright, retired Hope Public Schools principals Junanne Brown and Larry Muldrew, and HPS Social Services Coordinator Dr. Linda Clark.